Luckily, we are all night owls in this family, so I don’t have one of those fun 5 AM wake up calls from a child crawling in my bed to open presents on Christmas morning. Usually I end up getting everyone up around 9 or 10 AM. Before they’re all awake, I like to make a quick breakfast I can put on to bake while they’re opening gifts. Three of my families favorite things are biscuits, cheese, and sausage. 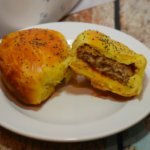 These Cheesy Sausage Stuffed Biscuits hit the spot every time! They are so easy to make. You can use refrigerated biscuits, precooked sausage patties, and some shredded cheese. 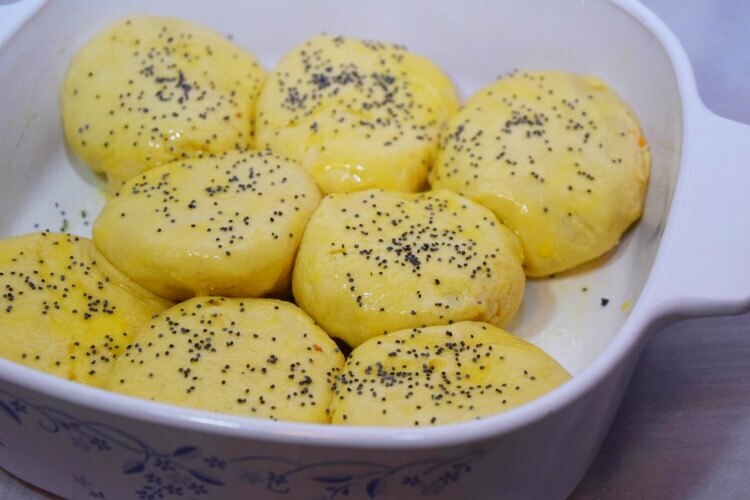 Then, I love to top them off with an egg wash and poppy seeds. Not only are these a great breakfast or brunch, but they also make a hearty appetizer for your holiday guests anytime – breakfasts, lunch, and dinner! 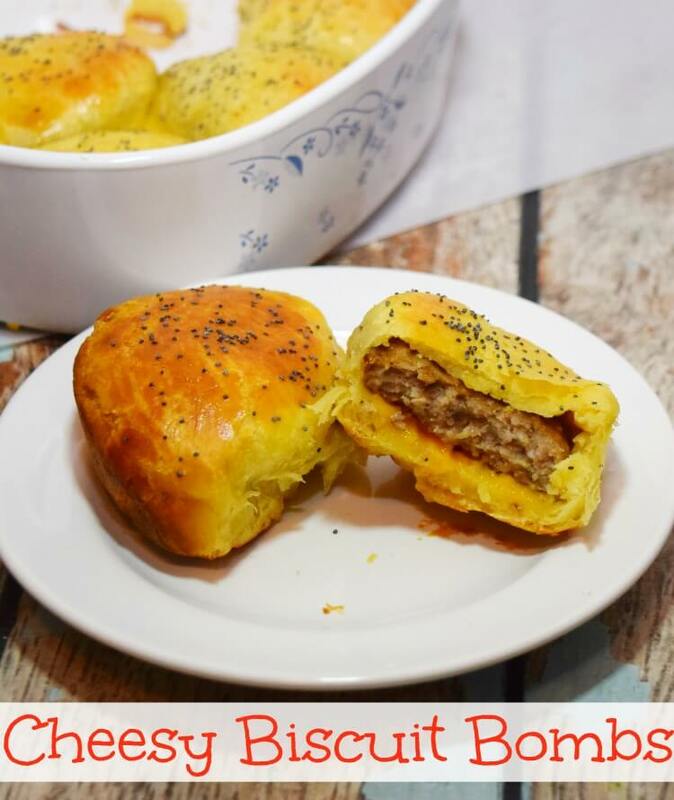 These Cheesy Sausage Stuffed Biscuits (or Bombs) are perfect for just about any meal or occasion — a holiday appetizer, a Christmas morning breakfast, or any other time! 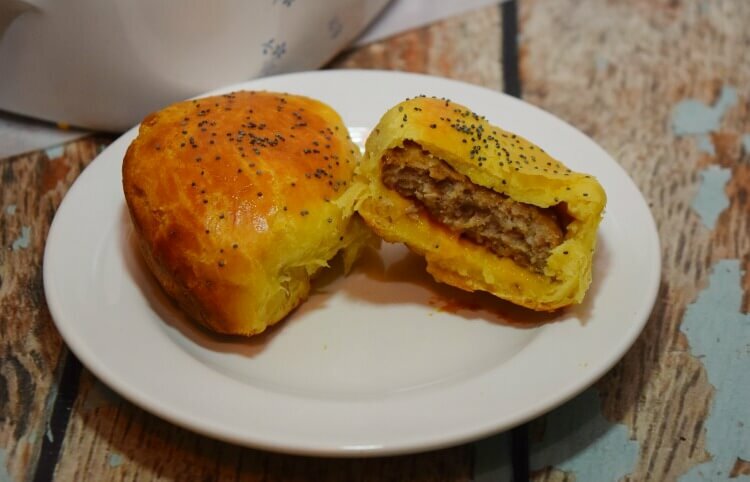 Lay a the Jimmy Dean Fully Cooked Pork Sausage Patty on the biscuit, top with cheese, and fold the biscuit over. Spray an 8 x 8 inch baking dish. Lay each biscuit in the dish. Beat one egg and brush over each biscuit. Then, top with poppy seeds. Allow to cool a few moments before serving. Looking for more ideas? Check them out here! Dulce de Leche Pumpkin Spice Poke Cake – No Eggs!